National Farm City Week is always designated the week before Thanksgiving. It is the perfect time of year to stop and think about where your food comes from. North Carolina farmers work tirelessly to produce an abundance of food and are served by a variety of businesses in our community. This year’s local Farm City celebration organized by N.C. Cooperative Extension, Forsyth County Center will take place on November 5 & 6, 2018, and includes a bus tour to NC State University, local tours to area farms and businesses, an information fair, and a banquet. The theme of the Farm City 2018 activities is ‘Bringing the University to the People’. N.C. Cooperative Extension is an outreach service of the public land-grant universities across the country. Through N.C. 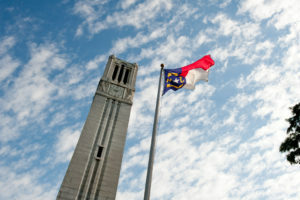 Cooperative Extension activities, the research and resources of NC State University and NC A&T State University are extended into the community in order to help people become empowered to improve their lives. N.C. Cooperative Extension, Forsyth County Center has programming in Agriculture including agronomic crops, small farms, livestock, the green industry, community gardening, urban agriculture, and Extension Master Gardener℠ volunteers; Natural Resources; Family and Consumer Sciences including foods, nutrition, parenting, home and financial management; Youth Development better known as 4-H and Community Development. The public is invited to join your local N.C. Cooperative Extension Department as we celebrate Farm City 2018. Find out more and register for each of the events. For more information about the Farm City 2018 celebration, call 336-703-2850. Participants are encouraged to exercise your right to vote early so that you can enjoy the local tours and banquet on Election Day! Early voting begins Oct. 17 and runs through Nov. 3. More information about early voting sites can be found here Forsyth County Board of Elections or call 336-703-2800.